This first teaching deals with the fact that we must keep ourselves encouraged in the Lord so that the discouragement of the world around us doesn't cause our love to "wax cold". Is your love "waxing cold" because the troubles of this world are overwhelming? 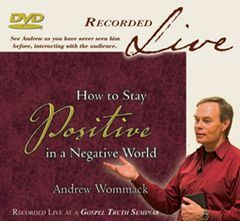 This teaching will show you how to focus your mind on God and His Word to stay positive. In this world of wickedness and negativity, it's critical that we learn to fight discouragement. 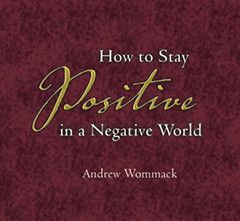 There are several examples in the Bible of how to stay positive during hard times. A look at Noah, David, and Jonah show us not to focus on the circumstances, but on God's grace and goodness. How do you trust God during the hard times? A look into the life of Abraham shows how to have faith and believe in the promises of God even when it's difficult. 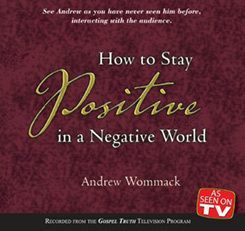 This teaching also explains how your imagination is a key ingredient, and how to use the Word of God to stay positive. To stay positive in a negative world, we must look past our problems and focus on eternity. When we focus on our problems, they are magnified. Instead, we should choose to rejoice in the midst of our trials. In this teaching, several examples in the Bible help explain this idea, such as Jesus, Paul, David, and more. Start focusing on the positive now! To stay positive in this negative world, we must learn to put things in proper perspective and live by the Word. God's Word is pure and perfect. It warns us of things, gives us wisdom, and gives us reason to rejoice. It is important that we study and learn the Word of God. In this negative world, we must intimately know God's Word and magnify it in our lives. An important part of staying positive in a negative world is having the baptism of the Holy Spirit. The Holy Spirit gives us wisdom and comfort. Andrew explains salvation, the experience of receiving the baptism of the Holy Spirit, the differences between these, and why they are significant in our relationship with God. This teaching will show you how to tap into the Holy Spirit and live positively, even in hard times!